Now remember, this is coming from a guy’s perspective, and this guy in particular is a pretty basic chef. You won’t see any cute, little one-bite meals pretending to be the main course on the plates I serve! Garnish without substance is definitely not the way I cook. To that end, I’ve put some real serious thought into which gadget would qualify as my all-time favorite. The term gadget is what gave me problems. I like Alton Brown of Food Network fame. In his kitchen, if it isn’t multi-purpose, he won’t have it. Using unusual items that are more or less gleaned from the hardware store or the junk drawer is his way coming up with fun new kitchen gadgets. “There are no prima donnas in my kitchen!” is one of his many catch phrases. Generally speaking, I just don’t do gadgets. After long thought, however, there is one item that I really like. 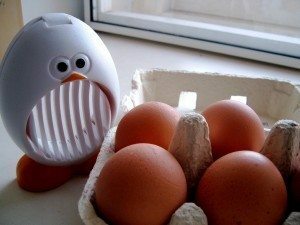 Even though it is somewhat of a single-purpose tool, I get more use out of a simple egg slicer than just about any other item in my kitchen. That is the one item that I have safely tucked away in the bottom drawer along the sink. And I use it often! I saw my first egg slicer about 5 years ago. My sister was running a small café at the time. While visiting one day, I watched her make egg salad using an egg slicer. First, she placed the peeled egg the “wrong way” in the egg slicer and ran the wire bound handle through the egg. Then, she picked up that same egg and laid it properly in the scalloped holder. Holding the egg slicer upside down over a bowl, she ran the wires through the egg a second time. The result was a perfectly diced egg with all pieces exactly the same size. I was amazed! In a matter of 1 minute, a half dozen eggs were diced exactly the same with practically no effort at all. I knew immediately that I had to have an egg slicer! Now I’m not a perfectionist, but having your eggs sliced (or diced) all the same just makes things look better. All my life, I had made egg salad by just passing a table knife through the eggs and chopping away in a haphazard manner. Now, thanks to the egg slicer, there is uniformity with the eggs and a higher level of creaminess as well. My wife says that she enjoys my chef salad better than the one she makes. I don’t see anything all that special about my salads over hers. (I think she just likes that I made them and she didn’t have to cook!) But one thing’s for sure: the crown jewel of our salads these days is the grouping of thinly sliced rings of hard boiled egg placed in a circle around the perimeter. A word of advice: If you’re going to use an egg slicer on anything other than eggs, choose wisely! One day, my wife wanted to fix some strawberries for desert. The frozen whole strawberries hadn’t thawed completely yet, but she was impatient. To save time (and provide uniform slices), she took my egg slicer and attempted to slice the strawberries. Upon pressing the slender light-duty wires into a semi-hard strawberry, the wires gave way –instantly ruining my favorite kitchen gadget. Words were spoken. It wasn’t pretty. To her credit, my precious egg slicer was quickly replaced, but this may be one reason I just don’t do gadgets. I think I get a little too attached. If you will be using your egg slicer on more than just eggs (or you’ve had mediocre results when using it slice things mushrooms and strawberries in the past), then you may want to look for a commercial-grade egg slicer which has slightly thicker wires, or use one with blades instead of wires like this mushroom egg slicer!